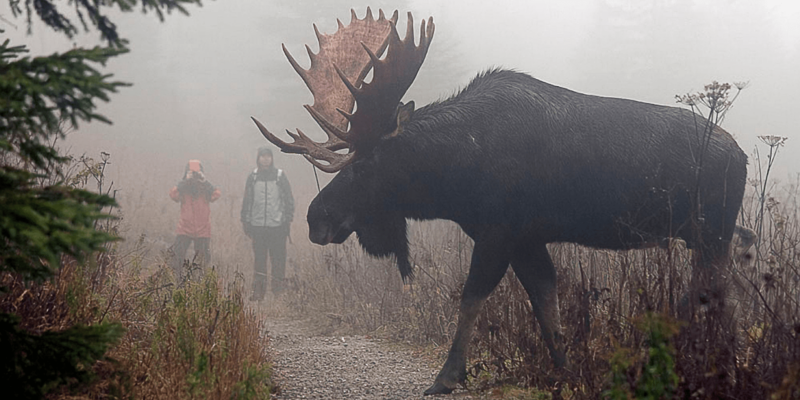 Moose are the biggest of the three, weighing as much as 1800 pounds. They can grow to be 6.5 ft. from hooves to shoulders. Elk and caribou “only” get to be about 3 to 5 ft. tall at their shoulders. The stately antlers grown by male elk are an elongated shape with many points coming off the large beams. Male moose have flat, wide antlers that can span six feet from tip to tip. Unlike elk or moose (or any other deer species) male and female caribou grow antlers – which have a cool “C” shape when you look at them from the side. Male caribou shed their antlers in November or December, after mating, while females will often carry them until June. Photo: Lindsay Kaye Ohlert. 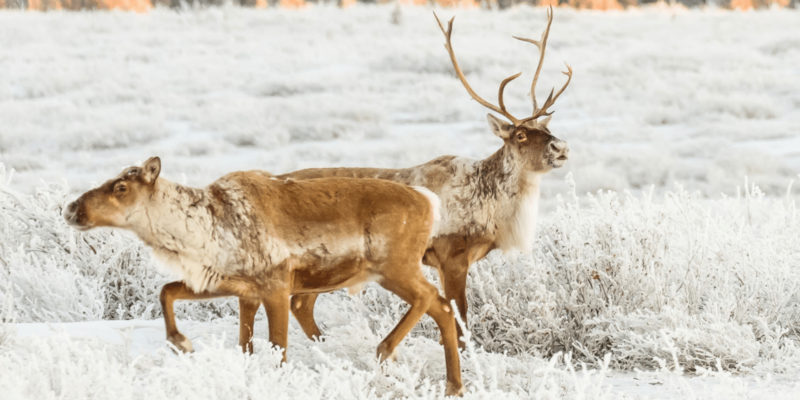 Caribou have white necks with fur lighter than the rest of their bodies, while the fur on elks necks is darker than the rest of their bodies and shaggy. Moose have dark brown fur all over their bodies with a bulbous nose and a dewlap hanging from their neck. If you hear a loud, high-pitched bugle, it’s an elk! Specifically a male elk, bugling to attract mates. Moose have more of wail sound and they grunt too. Caribou generally stick to grunting. 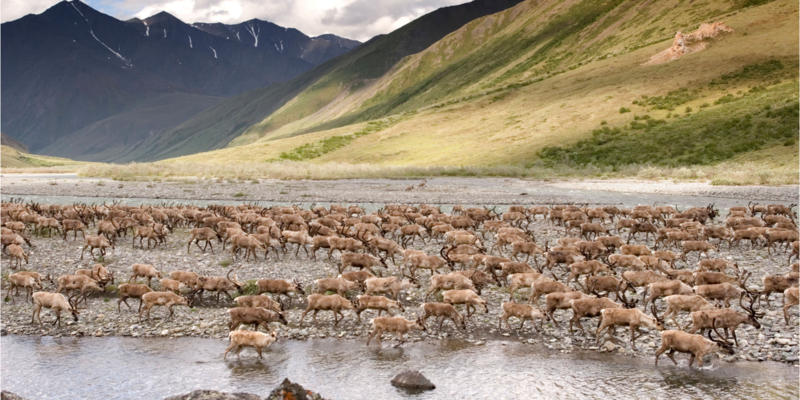 Caribou migration in Alaska. Photo: John Schweider. Moose are fairly solitary and usually hang out by themselves with the exception of mothers and their young and during mating season. Elk and caribou travel in large herds and are on the move, with some caribou herds numbering in the tens of thousands and traveling great distances during migration. Where Can You See Them in the U.S? Caribou can be seen in Alaska but sadly, are extremely rare in the lower 48 – there are just a few that still wander around the mountains in Idaho near the Canadian border. Our affiliate, Conservation Northwest, is hoping to change that! Moose live in northern New England, the Northern Rockies and Alaska. Climate change is making it tough for them however, as warming winters spell more trouble from deadly ticks. 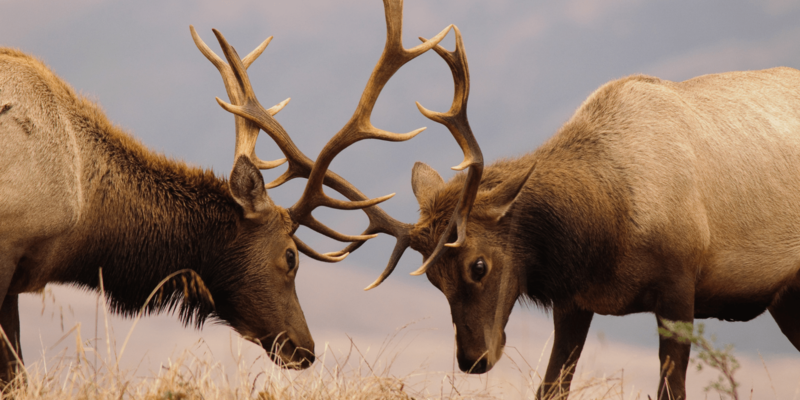 The Rocky Mountain and western regions make up the bulk of the elk range in the United States – Washington, Oregon, California, Montana, Idaho, Wyoming, Nevada, Colorado, Utah, Arizona, New Mexico and Alaska. Places like Yellowstone National Park and the Wyoming National Elk Refuge are good spots for elk viewing. Smaller populations of elk can be found in various Eastern and Midwestern states where they historically roamed, such as Arkansas, Minnesota and South Dakota; and they are being reestablished in eastern states including Kentucky, Pennsylvania, Tennessee, Virginia and West Virginia. Now that you know how to tell the difference between elk, moose and caribou, please lend your voice in support of our best conservation tool for protecting and restoring their habitats across America. Tell your members of Congress to permanently reauthorize and fund the Land and Water Conservation Fund today. *BTW, the photo at the top of the page is a herd of elk at the National Elk Refuge in Wyoming!